. Published on January 29, 2013 . This last Saturday, I went to one of my favorite galleries, Gallery Provocateur. It was for the closing reception for their annual Halloween show. Gallery Provocateur is a non-for-profit gallery in Chicago. They used to be located around the corner from the Congress Theater. Last Saturday was also the grand opening of their new space, now located around the corner from Humboldt Park at 1621 N Kedzie. It’s always a suggested dollar to get in, which goes to an animal rescue shelter, so you should donate the dollar. How can you go wrong with helping needy animals AND growth art? Answer: you can’t. 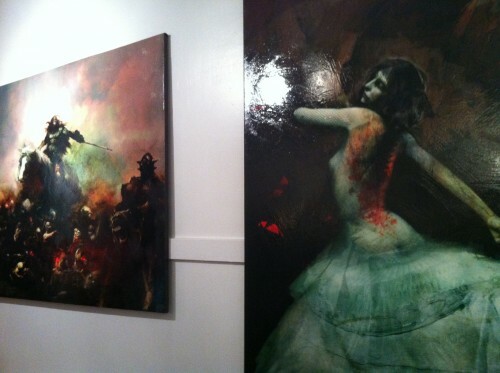 I first heard of Gallery Provocateur when I was researching one of my favorite artists, Christopher Shy. I discovered that he showed at only one gallery, and it was in Chicago. Awesome. The old space, while it had its charm, was pretty small for the turnouts that their receptions attract. The new space, however, is huge. It is housed in a 4,000-square-foot, renovated 1920s ballroom with a16-foot tall tin ceiling. Absolutely breathtaking. Like I said, this was the closing reception for their annual Halloween show, and if you are only going to one show at Provocateur, that is the one to go to. I wasn’t able to make earlier, so I jumped on the chance to go the closing reception. It’s probably the most goth thing I do all year. This show was amazing, as usual. A mix of beauty, the creepy, and of course, a handful of works by Mr. Shy. Even a milk jug robot! Did I mention that they had a tattoo parlor set up in one of the corners of the space? They did. This place is pretty intense, but its welcoming and warm, and the owners are always around mingling. The work on display was very true to the “Dark Arts” theme. Very dark and, well, provocative. Ranging from paintings, illustrations, sculpture, and owner Veronica’s couture dresses, this show had a lot on display. The new space really allowed for the gallery to show a lot of work without being over crowded. If you feel like just soaking in your surroundings and conversing over a glass of wine, relax on one of the couches. My wife went with me to the reception. It was our first date since moving. We had a great time. My mother in law came out to watch the kids, and we got to enjoy some of my favorite paintings in my favorite gallery, which I hadn’t realized just how much more I would like now in its new home. Great art, always on the darker side, with great people running the gallery—it’s always a great time. Now that I live twenty minutes away from the space, I don’t think I will be missing another show. Be sure to check their website and Facebook page for future shows. Hopefully I’ll see you at the next one.